Risks: This route is commonly used or smuggling activities and is best avoided at night. Do not camp near the top of the pass. 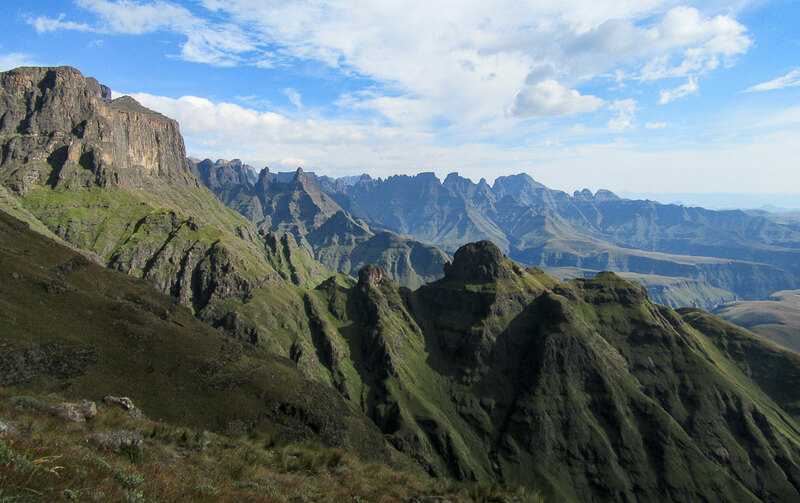 * Most Drakensberg passes fall into the extreme difficulty category. To differentiate the “easy” ones from the harder ones, a rating out of 10 is included after the extreme rating. 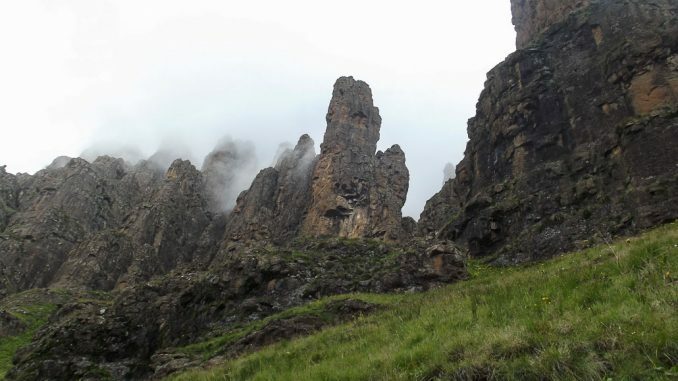 Organ Pipes Pass is probably one of the most commonly used passes in the KZN Drakensberg. 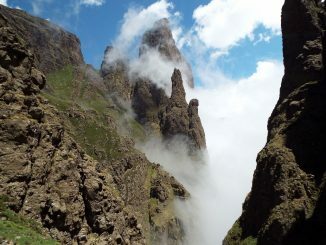 The name is derived from the very impressive wall of rock pinnacles near the top of the pass. In terms of scenery, there are few passes that can compete with this one. The view looking north towards Cathedral Peak. Take the N3 Southbound towards Durban. At Harrismith, take the Phuthaditjhaba/Clarens offramp. After roughly 13km, turn left as for Bergville. 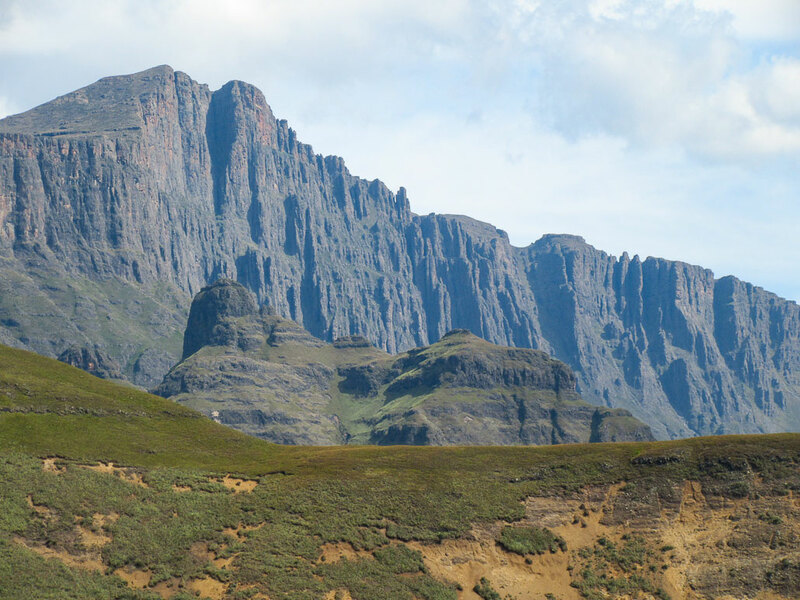 Shortly after passing the town of Bergville, take the right turnoff marked “Didima/Cathedral Peak Hotel”. 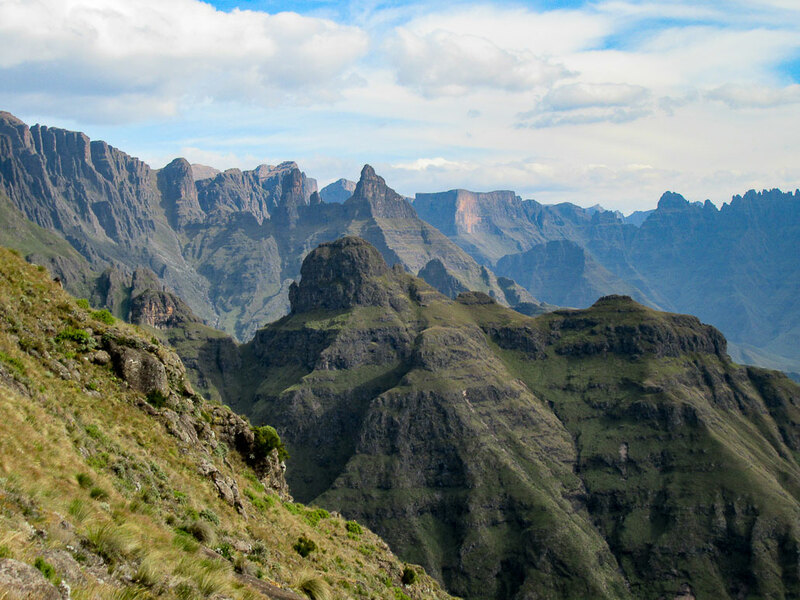 After a short distance, you will need to turn right once again at a sign marked “Didima/Cathedral Peak Hotel”. Take the N3 Northbound towards Harrismith. Take the Winterton offramp, and follow this road till you reach Winterton. At the traffic lights (the first traffic lights since the offramp), turn left. After about 1km, you will need to turn right, this should be signposted (saying Drakensberg World Heritage Site) but the sign is not always there. Follow this road till you reach a T-junction, at which you turn right. 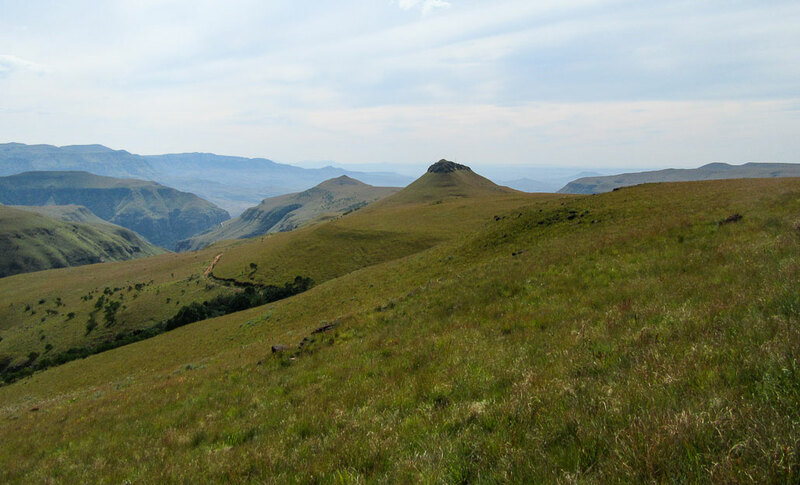 Roughly 1km later, you will see a left turn off marked “Didima/Cathedral Peak Hotel”. Take this offramp. You won’t need to turn off from this road before reaching the reserve. The boom gate at the entrance is the start of your route, although you will need to proceed to the Ezemvelo offices first to complete the mountain register and obtain your permits. Park at the boom gate at the entrance, or if you will be hiking for more than a day, at the Didima offices (in which case you will need to walk down the road back to the boom gate at the entrance). Walk up Mikes Pass. This is a road pass that dates back to the days of pine plantations in the area. These plantations have left a very noticeable scar on some of the ridges, and an infestation of alien trees. Volunteer teams are working hard to eradicate these alien trees, and have made amazing progress in recent years. Cleft Peak. Note the erosion in the foreground, this dates back to the old pine plantations. If you watch carefully, you will see a trail leaving to the left of the road about 3km in. This trail goes through the gap in the cliffs to bypass a significant portion of the road. It is occasionally possible to arrange to drive up the pass, or for Ezemvelo to take you up the pass, but this policy changes from day to day, and arranging it in advance does not necessarily result in such use being allowed. Once up Mike’s Pass, you will reach a locked boom gate. After this, keep an eye out for a turnoff to the right, which you will need to take, followed by a trail that turns off to the left. This description is notably vague, and I highly recommend using a GPS track to find the route as it is easy to go wrong, especially in the dark. Looking back towards the top of Mike’s Pass from near the Contour Path. The trail hits the contour path exactly at the turnoff for the pass. The pass starts off with a relatively steep slope up to the old fire lookout building, which is currently derelict. 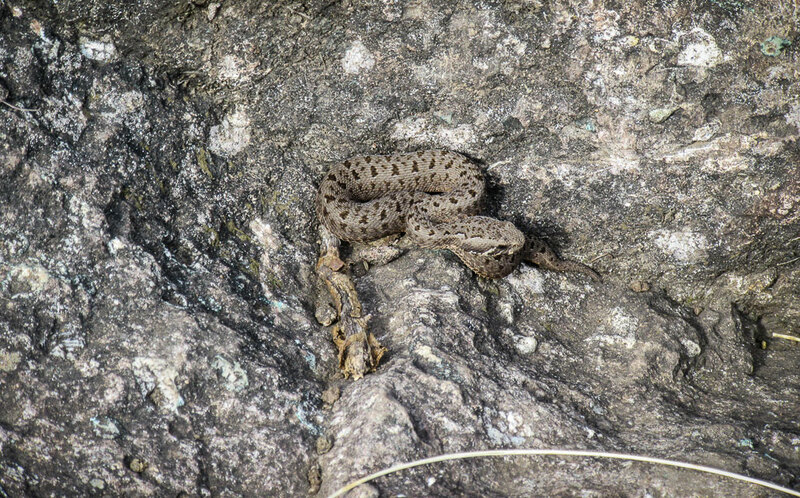 A Berg Adder warming up in the sun. From here, the trail gradually climbs the Thuthumi Ridge, before eventually reaching the final pass gully, and subsequently the summit. Fortunately the trail is very clear to follow, and once you are past the contour path, there are no spots where one is likely to lose the trial. 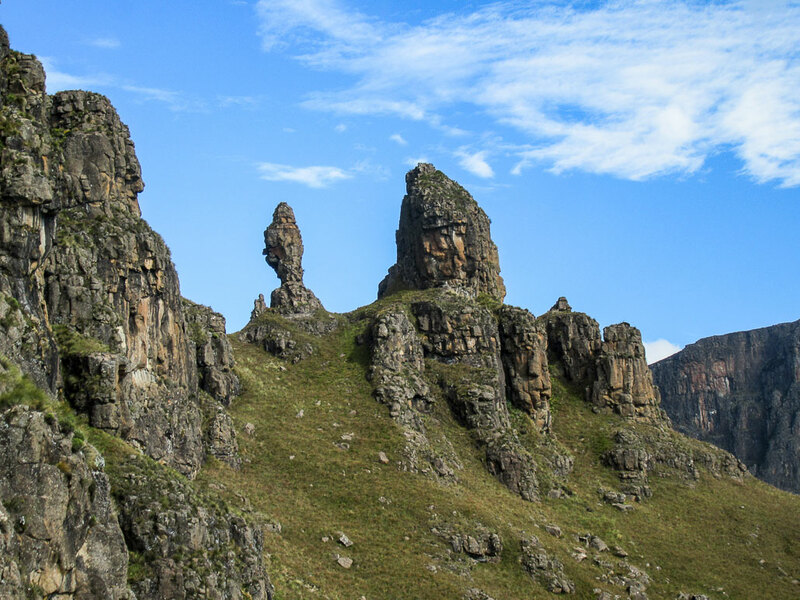 Interesting rock formations around 2700m on the pass. 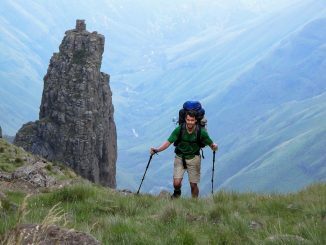 Normal hiking gear is required for this route, with a good quality raincoat and a warm top being vital, even in summer. Other essential items such as headlamps with spare batteries, first aid kit, a phone with mountain rescue’s number saved on it, etc. A hiker admires the view from the summit gully. 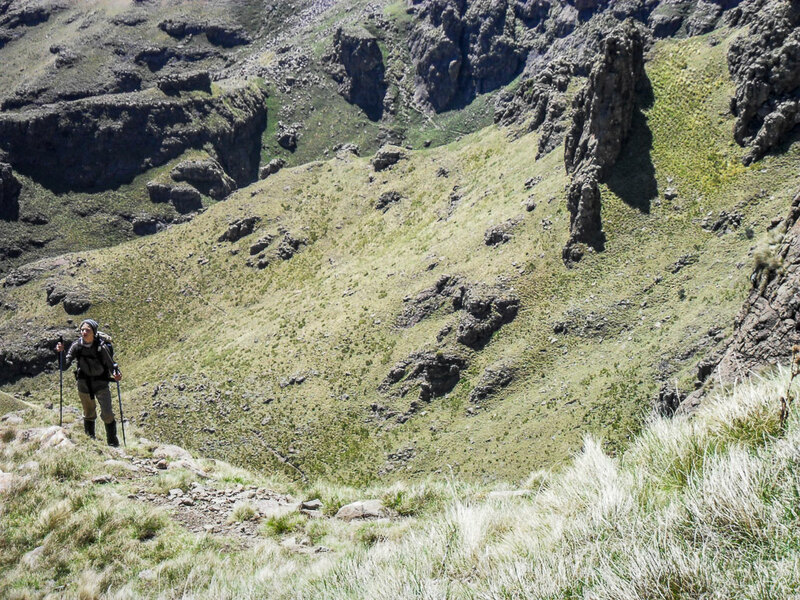 It is notable that there is no water on this route, and in the dryer months, water above the pass can also be reasonably far into Lesotho. So, make sure you carry enough water to get from your car to the top. The Didima Campsite is currently closed, and it is unclear when it will reopen. 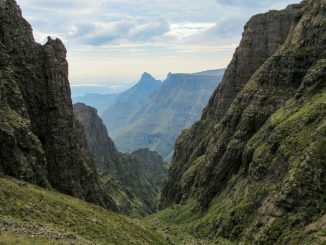 Cathedral Peak Hotel and Didima Resort are both very well situated, although they might be a bit fancy for the average hiker. The Camel, Column and Pyramid as seen from higher up on the pass. 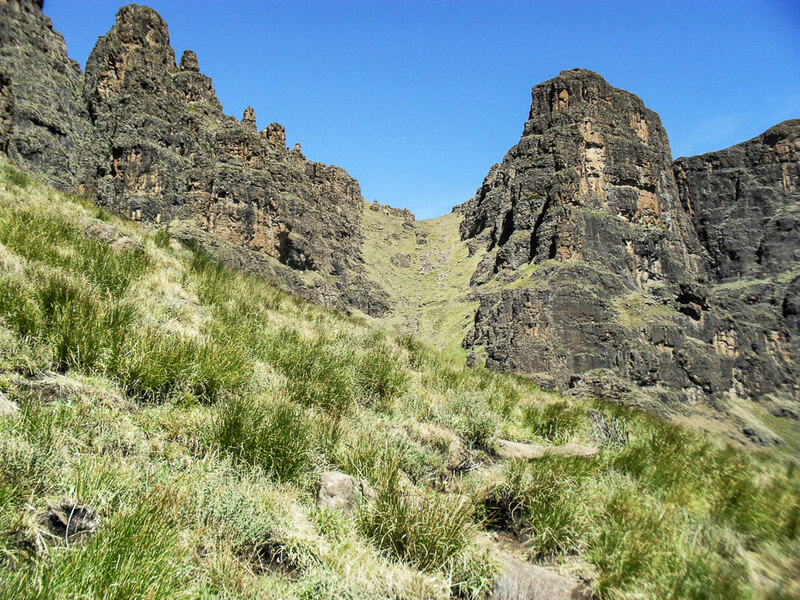 Members of the Mountain Club of SA can book Cambalala Hut, situated conveniently close to the top of Mike’s Pass. The old fire lookout is not suitable for sleeping in, and there is nowhere suitable to camp between the bottom of the pass and the top. 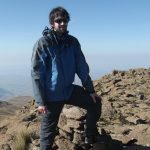 However, there are 5 different caves at the top of the pass, ranging from the fairly small Lower Ndumeni Caves to the legendary Rolands Cave.